We here illustrate one of a couple of compound engines designed and constructed by Messrs. Ahrbecker, Son & Hamkens, of Stamford Street, S.E., for Captain Mojaisky, of the Russian Imperial Navy, who intends to use them for aeronautical purposes. The larger of these engines has cylinders 3¾ in. and 7½ in. in diameter and 5 in. stroke, and when making 300 revolutions per minute it develops 20 actual horse power, while its weight is but 105 lbs. 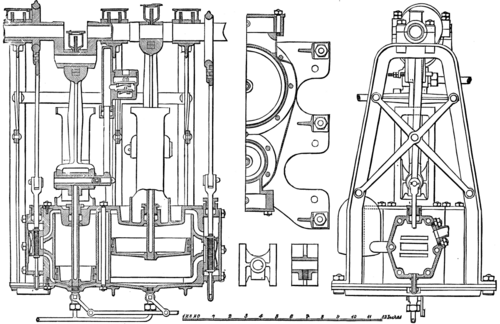 The smaller engine--the one illustrated--has cylinders 2½ in. and 5 in. in diameter, and 3½ in. stroke, and weighs 63 lbs., while when making 450 revolutions it develops 10 actual horse power. The constructors consider the power developed by these engines very moderate, on account of the low piston speed specified in this particular case. In some small and light engines by the same makers the piston speed is as high as 1000 ft. per minute. The engines now illustrated form an interesting example of special designing, and Messrs. Ahrbecker, Son, and Hamkens deserve much credit for the manner in which the work has been turned out, the construction of such light engines involving many practical difficulties,--Engineering.